Empty cupboard, empty freezer… What can I make?! I had one main ingredient I figured I could find something to do with… Kielbasa. Kielbasa is not a favorite ingredient for me because I just don’t know what the heck to do with it! The last time I decided to use it, I made skillet kielbasa and potatoes – it was great… but today I didn’t have any potatoes. I considered making mac ‘n cheese with it but I wasn’t sure how that would be so I started searching online to see if anyone else tried it. 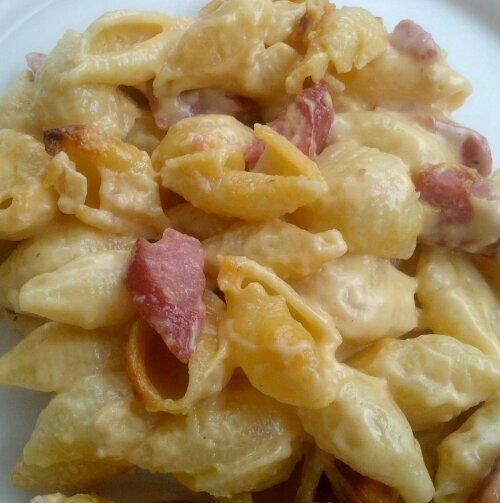 I found this recipe Mustard Kielbasa Mac and Cheese. It sounded good but I only loosely followed it because I didn’t have exactly the same ingredients. For example, I had Turkey Kielbasa, medium shell pasta, only 2 cups of cheddar cheese, no arugula… and only 1 cup of milk (I used evaporated milk to make up the difference)… So you could say it’s very different from the recipe but still, the recipe was my inspiration! I love the flavor of the kielbasa when it’s crisped up in the frying pan! Yum! I guess it’s a hit – my little guy just asked for seconds!